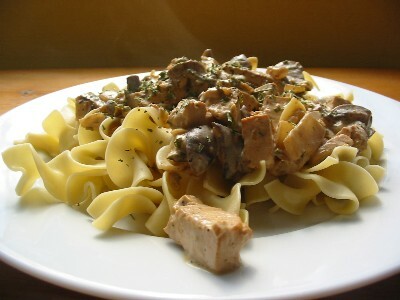 If you like the combination of creamy sauce, mushrooms and noodles found in classic Beef Stroganoff, then try this updated salt free version made with tofu. I altered an old Vegetarian Times recipe to meet my sodium restriction and the results are heavenly. The perfect dish for a blustery spring day. Note to vegetarians: although this dish contains no actual meat it does contain a teaspoon of beef bouillon. Drain tofu on towels, pressing gently to release as much liquid as possible. Slice drained tofu into long strips, about 3 inches by 3/4 inch by 1/2 inch in height. Set aside. Melt 1 T. butter in a large saucepan over medium-high heat. Add onion, garlic and mushrooms and cook, stirring, about 10 minutes. Add chives and pepper and stir. Remove mixture from pan and set aside. Melt remaining tablespoon of butter in pan over medium heat. Add tofu and cook until golden brown, about 10 minutes. Add the mushroom-onion mixture to tofu, then add sour cream and faux soy sauce. Stir gently. Let cook for a few minutes to blend together. Remove from heat and spoon over egg noodles. Serve immediately.